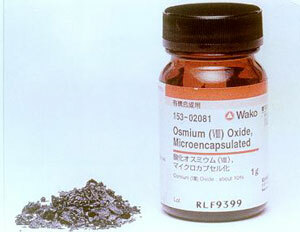 Source: FUJIFILM Wako Chemicals U.S.A. Corp.
Osmium (VIII) Oxide is used for asymetric oxidation of diols. The product is microencapsulated in polystyrene, which reduces volatization of the oxide. This microencapsulation technology also allows for the product, when used as a catalyst, to be recovered and reused. FUJIFILM Wako Chemicals U.S.A. Corp.
MORE FROM FUJIFILM Wako Chemicals U.S.A. Corp.